• Osteoarthritis affects 20% of the U.S. population; 44% of OA patients are not active. • Primary and secondary OA must be differentiated. • NSAIDs, not COX-2 inhibitors, are still the pharmacologic treatment of choice for OA. Osteoarthritis, also known as "degenerative joint disease," is the most common form of arthritis and causes more work disability in the United States (17%) than any other disease. Arthritis affects 20% of the U.S. population, about half of whom primarily have OA. Long thought to result from "wear and tear," OA is now known to have genetic, traumatic, metabolic, and developmental causes, which complicates prevention and treatment. OA is found radiographically in almost all 75-year-old patients, most of whom are asymptomatic. OA occurs about equally in men and women ages 45 to 55 but after 55 is more common in women (CDC, 2005). Most OA patients are not seriously affected and are asymptomatic. Others, however, require joint replacement surgery because of its severity. Although OA is considered a noninflammatory type of arthritis affecting primarily the cartilage, it actually involves active biochemical disease processes as well as mechanical forces that affect the entire synovial joint. An OA variant affecting primarily the hands runs in families and is inflammatory. Women are more prone to this inflammatory variant of OA of the hands that causes Heberden's nodes (in distal interphalangeal [DIP] joints) and Bouchard's nodes (in proximal interphalangeal [PIP] joints). The articular cartilage may not even be involved, with the disease process centered more on subchondral bone turnover (Peterson et al., 1998). Quadriceps muscle weakness might precede the onset of knee OA, indicating the importance of biomechanical factors (Slemenda et al., 1997). Osteoarthritis can be separated into primary (idiopathic), hereditary (resulting from collagen gene defects), and secondary. Secondary OA results from previous cartilage damage. Occupations causing repetitive joint trauma predispose a patient to OA. Episodic trauma, congenital anatomic abnormalities (slipped capital femoral epiphyses, congenital hip dysplasias), neuropathies, and endocrine-metabolic causes (obesity, hemochromatosis, Wilson's disease, CPPD disease, Paget's disease, acromegaly) all might lead to OA. Inflammatory arthritides such as RA, infections, or gout damage cartilage and are often followed by the development of OA. Occupational kneelers (e.g., shipyard workers, miners, carpet or floor layers) have a significantly higher incidence of knee OA than control groups of clerical workers (Maetzel et al., 1997). However, repetitive sports activities such as longdistance running are unlikely to cause OA in the absence of joint injury or antecedent joint abnormality (Panush and Lane, 1994). More than 44% of patients with diagnosed OA are inactive (Gordon et al., 1998). Low-impact activity in normal joints is not associated with OA, but high-intensity and high-impact activity resulting in injury is associated with OA. Mechanical risk factors might affect the initiation more than the progression of OA. Most mild OA does not progress to severe joint damage. Mild OA might be a different disease than severe OA, which depends on processes other than early OA. Most OA is asymptomatic, an incidental finding on radiographs performed for other reasons. No treatment or further evaluation is indicated for asymptomatic OA. Early symptomatic OA is characterized by local pain of gradual onset exacerbated by using the involved joint. Pain typically worsens as the day progresses and is relieved by rest. There is less than 30 minutes of localized morning stiffness and no constitutional or systemic symptoms, and the gel phenomenon (stiffness after periods of rest and inactivity) resolves within several minutes of activity. Damp, cool, rainy weather often exacerbates symptoms because of changes in intra-articular pressure associated with changes in barometric pressure. Patients with OA of the knees might complain of buckling or instability, especially when descending stairs. OA of the hip can manifest as pain radiating from the groin and down the anterior thigh. OA of the neck might be felt in the neck, back, or upper extremities, causing pain, weakness, or numbness. As OA progresses, pain can become continuous, including at night. Primary OA can be divided into three classifications: generalized OA, large-joint OA, and erosive OA. Generalized OA involves five or more joints, most often the DIP joints of the hand (Herberden's nodes), the PIP joints of the hand (Bouchard's nodes), the first carpometacarpal joint, the first MTP joint of the feet, and the knee, hip, and spine. There is a significant familial component. Large-joint OA of the knees and hips might occur as part of generalized OA or alone. OA of the knees often occurs in the medial and patellofemoral compartments. OA of the hips can be characterized in two subsets, central and superior poles. Central or medial involvement of the hip joint space occurs in the setting of generalized OA, is usually bilateral, and is seen in women more than men. Most hip OA is superior pole, usually unilateral, seen more in men, and occurs without other joint involvement. As many as 40% to 90% of cases of adult hip OA might arise from subtle developmental abnormalities of the hip, including acetabular dysplasia, developmental (formerly "congenital") hip dislocation, Legg-Calve-Perthes disease, and slipped capital femoral epiphysis (Brandt and Slemenda, 2004). A rare form of primary OA known as erosive OA involves the hand's PIP and DIP joints equally, with significant inflammation. Other joints are often not involved, although 15% of erosive OA cases might subsequently evolve into seropositive RA (Kujala et al., 1995). 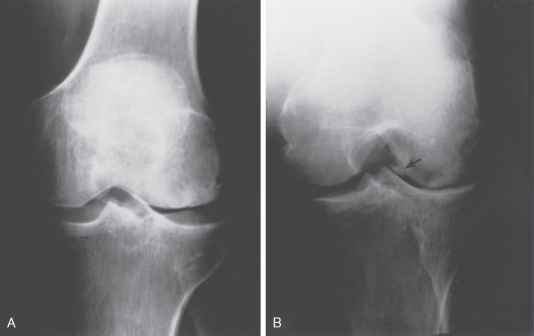 Physical findings of OA typically include joint swelling, tenderness, crepitus, and enlargements at joint margins, causing deformity. The location of pain should be precisely localized as to whether it is truly articular or periarticular; if pain is located in the joint, an inflammatory or infectious cause should be ruled out first. Patients might have reduced ROM or, in severe cases, joint instability, resulting in excess motion or locking because of loose cartilage fragments. Warmth and soft tissue swelling because of joint effusion might be present, but a markedly swollen, hot, erythematous joint suggests a septic or microcrystalline disease rather than OA. Clinical study criteria for OA classification are helpful as a means to standardize the diagnosis (see eTables 32-2 and 32-3 online). Although the diagnosis of OA can almost always be made by history and physical examination, definitive diagnosis can be helped by synovial fluid analysis, radiography, and normal ESR, ANA, and RF during symptomatic periods. Synovial fluid analysis of large-joint effusions can be used to exclude other processes. Joint effusions in OA typically show leukocyte counts lower than 1000 WBCs/mm3, predominantly lymphocytes (Table 32-2). Serum tests might be misleading because ESR rises with age and 20% of healthy older adults have positive RF levels. A greatly elevated ESR suggests a process other than OA. Although many have been identified, biochemical markers of OA are not generally useful to the practicing clinician at this time. Radiographs are generally the first-line confirmation of the presence of OA. Treatment should not be based solely on radiographic abnormalities, however, given the frequency of asymptomatic joints demonstrating radiographic OA changes. OA changes include osteophyte formation, asymmetric joint space narrowing (defined as <3 mm on a weight-bearing knee), and subchondral bone sclerosis (Figs. 32-6 and 32-7). Later in the disease process, subchondral cysts with sclerotic walls might develop. Periarticular osteoporosis and marginal erosions suggest RA or some other inflammatory arthritis rather than OA. Patients with OA involving atypical joints (MCP joints, wrists, elbows, shoulders, or ankles) should be evaluated for an underlying disorder such as CPPD or hemochromatosis. From Altman R, Asch E, Bloch G, et al. Development of criteria for the classification and reporting of osteoarthritis: classification of osteoarthritis of the knee. 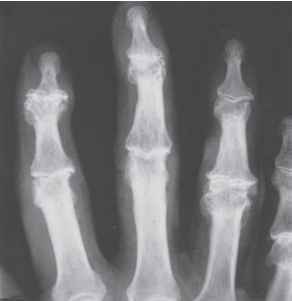 Arthritis Rheum 1986;29:1039-1049, with permission of the American College of Rheumatology. 'Alternative for the clinical 89% specific. ESR, Erythrocyte sedimentation rate (Westergren); RF, rheumatoid factor; SFOA, synovial fluid signs of OA (clear, viscous, or white blood cell count <2000/mm3). physical examination. No currently available treatment has been shown to alter the natural history of the disease. Therefore, the goal of management of OA is primarily to relieve pain, stiffness, and swelling. The physician seeks to reduce limitation of motion and disability without causing iatrogenic side effects. Patients and their families must also be educated about the disease and their treatment options (Box 32-1). and family education, and assistive devices. The patient's ability to perform both self-care ADLs and IADLs requiring higher functioning (e.g., shopping, driving, writing) should be assessed. Physical and occupational therapists can provide great benefit by offering an exercise program and assistive devices to maintain independence and minimize symptoms (Fransen et al., 2001). Patients benefit from the use of canes, walkers, bathtub and toilet wall bars, and dressing sticks for socks and from the other methods of joint protection and symptom relief, such as heat massage. Rest is important for patients with acute pain. Otherwise, helpful exercise programs include swimming, other aerobic conditioning, and walking (van Baar et al., 1999). Weight control and weight reduction have also been shown to improve symptoms (Messier et al., 2004). From Hochberg MC. Osteoarthritis: clinical features and treatment. In Klippel JH (ed). Primer on the Rheumatic Diseases, 12th ed. Atlanta, Arthritis Foundation, 2001, pp 293-295.
analgesics) may also be helpful. The addition of tramadol (Ultram, 200 mg/day) in patients responding to 1000 mg/ day of naproxen has been shown to allow significant reduction (by half) in the naproxen dose needed without compromising pain relief (Schnitzer et al., 1999). Misoprostol (Cytotec) was the first U.S. Food and Drug Administration (FDA)-approved drug for GI protection when used with NSAIDs, although higher doses of famoti-dine (Pepcid), nizatidine (Axid), and omeprazole (Prilosec) also decrease the risk of NSAID-induced gastric ulcers. Currently, NSAIDs plus a PPI such as omeprazole remains the treatment of choice for prevention of NSAID-induced gastric ulcers. Opioid analgesics and limited intra-articular corti-costeroid injections (up to 4 injections per joint per year) are the remaining traditional choices. Opiates should generally be avoided for long-term use but might be helpful for acute exacerbations. It is unclear whether the risks of long-term NSAID use outweigh the addiction potential of chronic opiate use. Intra-articular glucocorticoids are often used and are particularly useful in patients with contraindications or continued pain despite NSAIDs. This modality is postulated to work by decreasing cartilage catabolism and osteophyte formation. A meta-analysis found that patients receiving intra-articular steroid injections for OA of the knee were twice as likely to have short-term improvement as controls (Arroll et al., 2004). Data on injection of the hip and knee joint show the most promise, but efficacy at other sites is less certain. Aseptic technique should be used to prevent iatrogenic complications of infection. 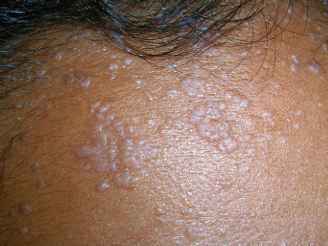 Patients should be counseled on postinjection complications such as bleeding, infection, skin hypopigmentation, fat necrosis, and steroid flare. Because OA is a common incurable disease that causes pain, many other treatments, including dietary supplements and other alternative therapies, have been tried for centuries. Balanced hormone therapy, copper bracelets, bee venom, vitamins, herbs, homeopathic remedies, and certain types of foods are promoted as effective treatments or cures for OA. Family physicians should be aware of proven and unproven remedies used by their patients. One therapy shown to be efficacious is glucosamine sulfate. Glucosamine and chondroitin sulfates both stimulate the production of proteoglycan in cartilage and inhibit its breakdown. Over-the-counter formulations vary in the amount of glucosamine (made from crab shells) and chondroitin (processed from cow cartilage). Research has shown that patients have moderately benefited from glu-cosamine and chondroitin supplements over 3 years with less knee joint space narrowing on radiography, significant reduction of symptoms, and no adverse effects (Richy et al., 2003). The major studies of glucosamine used two different formulations of the supplement, which yielded different results, the Rotta brand and non-Rotta formulations. A 2005 Cochrane review found that a non-Rotta preparation failed to show benefit in pain and function, whereas the Rotta preparation showed that glucosamine was superior to placebo in the treatment of pain and functional impairment resulting from symptomatic OA. Studies for chondroi-tin are less convincing, with no consistent improvement in pain or functional status (AAFP, 2006). The safest daily intake is 1500 mg/day of glucosamine and 1200 mg/day of chondroitin. Most capsules containing both minerals are also formulated with manganese, theorized to assist in pro-teoglycan metabolism but not studied (Richy et al., 2003). A meta-analysis of 11 studies found that S-adenosylmethi-onine (SAMe) was as effective as NSAIDs at reducing pain and functional limitations, with a somewhat better adverse effect profile (Soeken et al., 2002). A Cochrane review of herbal therapies for OA found two studies demonstrating that avocado-soybean unsaponifi-ables showed beneficial effects on function, pain, intake of NSAIDs, and global evaluation (Little et al., 2004). Another beneficial intervention is transcutaneous electrical nerve stimulation (TENS) for OA of the knee; electrical stimulation has been shown to improve knee OA moderately by 25% and cervical OA by 12% (Osiri et al., 2004). Studies comparing acupuncture with a sham control found greater improvement in those receiving the actual treatment (Berman et al., 2004; Ezzo et al., 2001; Vas et al., 2004). A meta-analysis found that acupuncture was more effective than placebo in pain reduction in peripheral OA (Kwon et al., 2006). Two studies found that therapeutic touch, an energy modality, showed benefit in OA (Gordon et al., 1998). Although previously cited as beneficial for OA secondary to antioxidants, the literature reports an increased risk of cardiovascular disease with vitamins C and E (Alkhenizan and Palda, 2003). Other, less traditional therapies have received much media attention but not shown effectiveness. Cycles of three or more weekly intra-articular injections of hyaluronic acid (viscous substance in synovial fluid that lubricates and protects joints) have been used, with partial success (Abramow-icz, 1998a). Hyaluronate sodium (Hyalgan) and hylan G-F 20 (Synvisc) are FDA approved for OA of the knee. Onset of pain relief can take several weeks and can last for 6 months or longer. Meta-analyses of hyaluronic acid have shown minimal effectiveness versus placebo. The cost/benefit ratio favors therapies other than joint injection (Lo et al., 2003). Other largely unproven therapies include doxycycline, diathermy (deep heat using ultrasound), iontophoresis with dexamethasone, and intra-articular therapeutic gene therapy before joint replacement. Although diathermy and iontophoresis are widely used and have widespread anecdotal reports of subjective relief of pain, there is no definitive proof of benefit. Treatment of osteoarthritis begins with nonpharmacologic modalities, including weight loss (Messier et al., 2004), physical therapy (Fransen et al., 2001), exercise (van Baar et al,, 1999), and orthotics if needed (SOR: A). Acetaminophen and NSAIDs are both first-line pharmacotherapy for pain associated with OA, although NSAIDs appear to be more effective (Towhead et al., 2006) (SOR: A). Intra-articular glucocorticoids show short-term improvement in pain associated with OA of the hip and knee (Arroll et al., 2004) (SOR: B). Treatments such as Synvisc (Lo et al., 2003), glucosamine (Richy et al., 2003), and acupuncture (Kwon et al., 2006) are often used for OA relief before surgical measures (SOR: B).